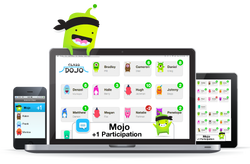 Class Dojo is a free tool on the web that helps with classroom management. Most of the features you will use will be from their website. However, a nice added feature is that there is a mobile app that you can use to add or subtract Dojo points when your class is on the go. Teachers can add students (or groups) from their classes, create a picture or avatar for each student or group, and choose the behaviors or learning traits they want to reward. Each time students get a point it makes a fun sound effect that the students come to know and love. You can also give students and parents individual logins so they can track behavior progress throughout the year. Check out the "About" part of their website to learn more. Class Dojo shares everything you could ever want to know on their YouTube Channel. You'll find how to's, success stories, and ideas for using it in creative ways. I'd be glad to come show you how to get it all set up. I can also connect you to other teachers in the county who enjoy using it and have found success. Email me or send a note to Tech Help and I'll schedule a time to work with you.